Draw the dachshund. Outline in fine liner and colour in. Use the contrasting coloured ink to stamp patterns on the coloured paper. Cut 2 pieces of twine. Glue a short piece under the dachshund’s mouth. Tease out one end of a second piece (this will be the strings of the balloons) and glue down. You may need to use the double sided tape to keep the teased bits in place. Make sure the tape is in a position which will be covered by the balloons. Now the stamp ink will be dry. Cut lots of oval balloon shapes and the party hat out of the stamped coloured paper. 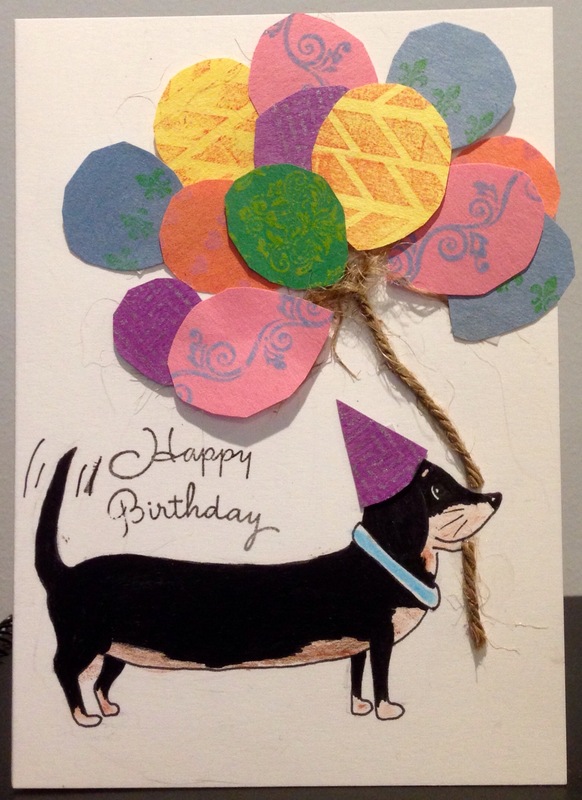 Use double sided tape to attach the balloons and party hat to the card. Stamp ‘Happy Birthday’ on the card and add the tail wagging lines.